Agassiz families use on-street parking spaces for pick up and drop off. Please do not park in the church parking lot or the driveway. The driveway is reserved for Agassiz staff and parent helpers who are not Somerville residents. 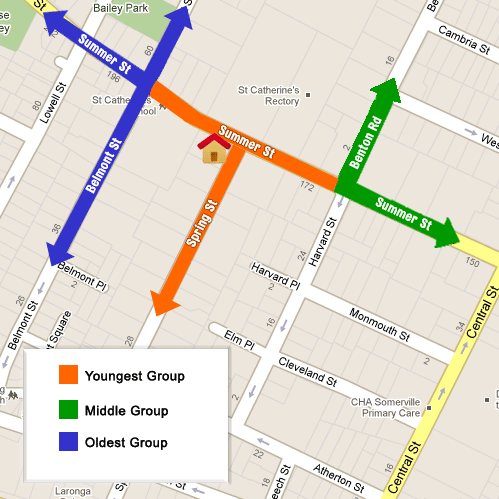 YOUNGEST GROUP: Summer Street between Belmont and Harvard Streets, Harvard Street and Spring Street. MIDDLE GROUP: Benton Road, Summer Street west of Harvard Street, and side streets between Central Street and Benton Road. OLDEST GROUP: Belmont Street, Lowell Street and Summer Street west of Belmont Street. School administration will evaluate this plan every year and make adjustments as needed to maximize its effectiveness. In the event that these three groups are not roughly equivalent in number, the school may reassign members to different groups in order to ensure equivalency.